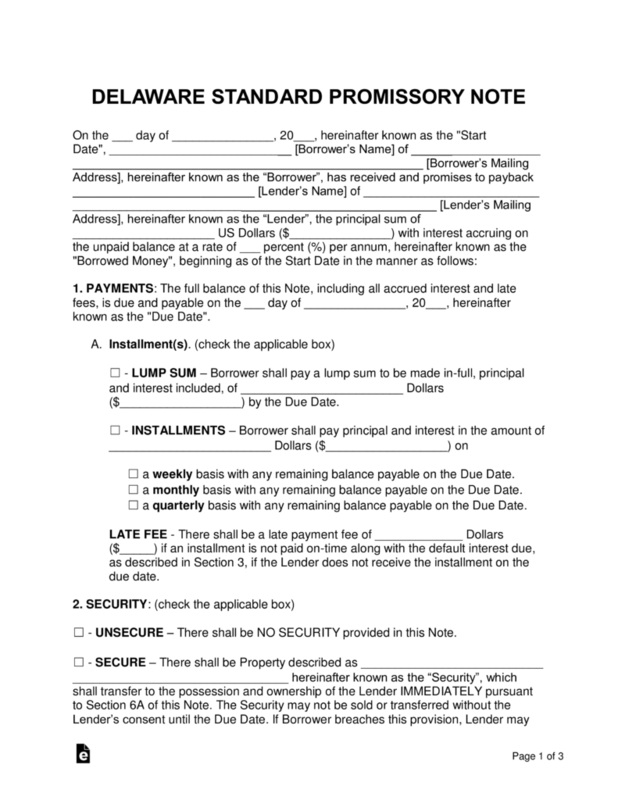 The Delaware promissory note templates are documents created to bind two parties into a contract to help ensure a loaned balance is paid in a timely manner. In the agreement, both the lender and borrower agree on various details of the loan, such as the payment method, the interest rate, late fees, the time frame required for acceleration, and other pertinent information. Ensure a legal interest rate is chosen for the agreement by checking the Usury rate for Delaware found in 6 Del.C. § 2301(a). Secured Promissory Note – Protects the lender from financial damage by being guaranteed either a home, vehicle or other worthy possession of the borrower in the case of a default on the balance. Unsecured Promissory Note – This version provides very little to no protection for the lender as there is no security in the case of a default. Because of this, the lender should ensure the borrower has a reputable credit and/or is a trustworthy individual.